Please select a size. UK 5 - In StockUK 5.5 - In StockUK 6 - Low StockUK 7 - Low StockUK 8 - Low StockUK 9 - Email me when back in stock Please select a size. 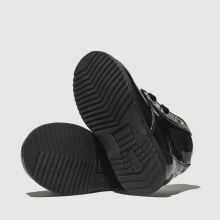 Pretty and perfect for the new season, Lelli Kelly deliver the Camille boot for little fashionistas in a sleek black patent leather upper for a big style impact. This kids' profile features velvety black lacing, side zipper and is complete with a bow.